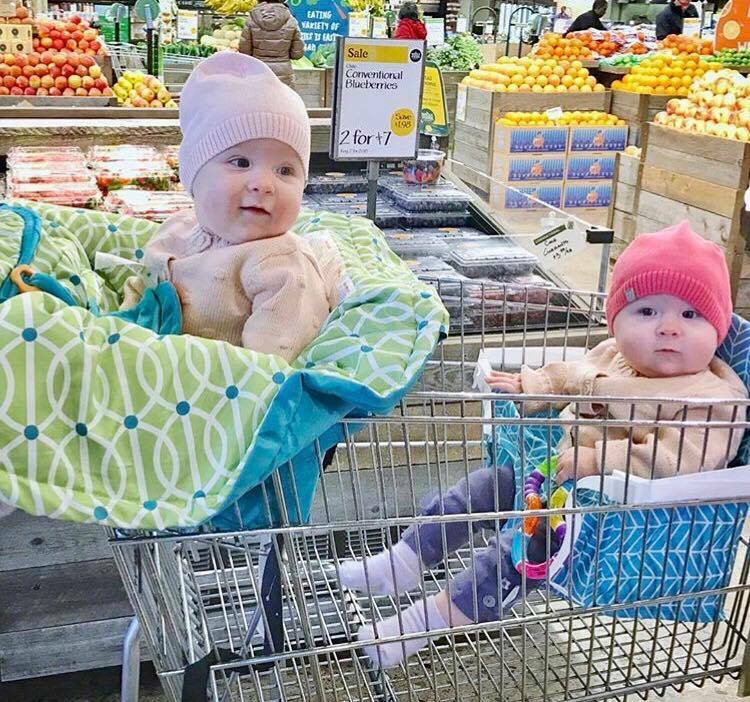 The first time I took my twin girls to the store after they had outgrown their snap n’ go stroller, I posted in one of my twin mom groups asking for help with logistics. How do I get them from my minivan, into the double cart, that’s inside the store? What if there is no double cart? If I just put them in my double stroller (link to my absolute favorite double stroller), I can fit approximately 2.5 groceries in the bottom. If I have my 3-year old with me, that’s an added complexity. I got many answers to my question, but I wasn’t quite comfortable with any of them. My go to method was to put 1 baby in the shopping cart and 1 baby in a buggy bench . That method worked fine if I was just getting a few items, but there was no room to do an entire grocery shopping trip. *Post contains amazon affiliate links. If you make a purchase through a link I provide, I will receive a small compensation at no extra cost to you. Thanks for supporting my blog! I am a very independent person, and it is important to me that I am able to do things on my own. My husband used to get frustrated when I would drag all 3 kids with me to the grocery store because he thought it was unnecessary stress that I put on myself. He finally came to understand that it’s actually very freeing to me. 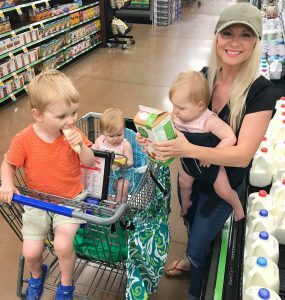 I feel claustrophobic thinking that I can’t even go to the grocery store with my children without having someone along to help! I was browsing Instagram one day (click to follow me! 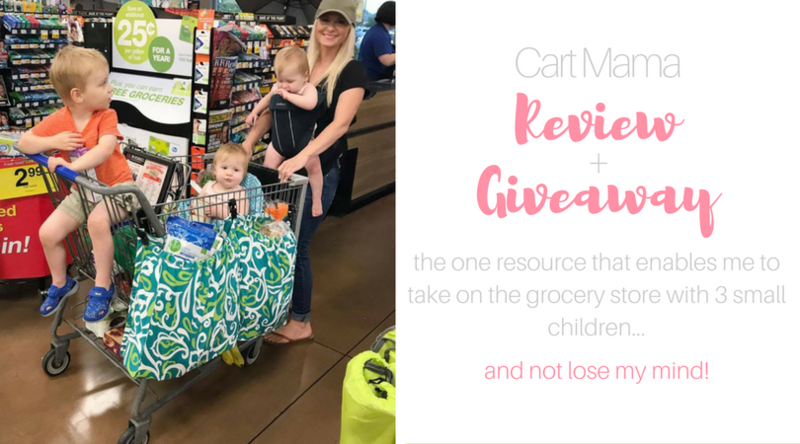 ), when I came across this magical product called the Cart Mama (read through to the end to enter to win one of your own). Clicking through the pictures, it looked like the perfect tool to help me grocery shop with the kids, ON MY OWN. *This item was given to me at no cost in exchange for a review. All opinions and words are 100% my own! I usually go to the grocery store on my own, but for the sake of this review, my hubby came along to snap some photos. How Did the Cart Mama Happen? Reading the story of how the Cart Mama came to be, gave me all the feels. Basically, Kelly, the creator, was at the grocery store with her two children: a toddler and an infant. She had the toddler in the cart and was holding the baby, sound asleep in her car seat so that she could fill her cart with groceries. My back and arms just hurt reading this. I know how heavy those car seats are; but if my baby is asleep (or it’s RAINING or SNOWING), I am NOT getting them out of the car seat to wear them! Anyways. Kelly was going through the store, and when she rounded a corner, she knocked over a display of diet pills with the baby car seat. I absolutely panic just thinking about this situation. 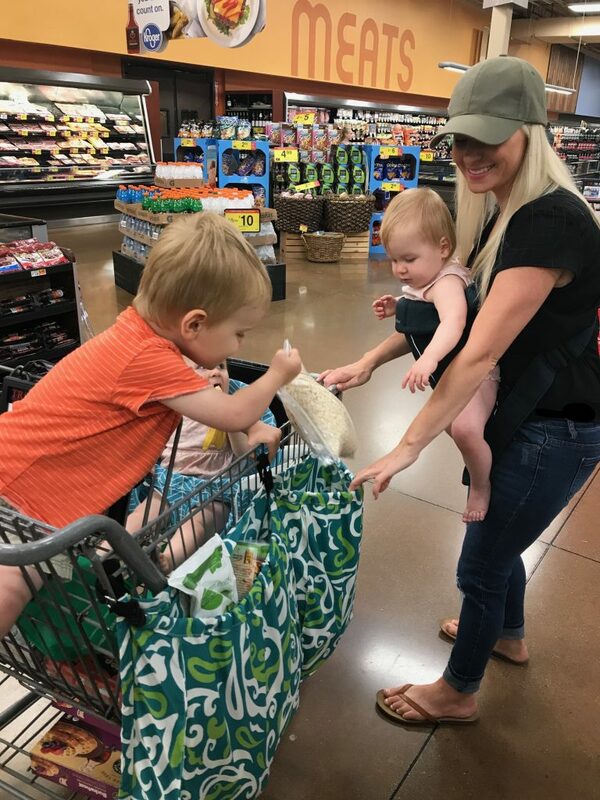 Of course, her baby woke up crying as she frantically tried to pick up the display, wondering why there wasn’t an easier method to grocery shop. Kelly decided that there HAD to be a better way, so she invented the Cart Mama. I just love when a mom sees a problem and finds a freaking solution. What is the Cart Mama? The Cart Mama is basically like an extension of your cart. It attaches to your cart, so you can put your baby in their car seat actually INSIDE the cart, instead of carrying them, or putting them in the top part of the cart (which is dangerous and can ruin your car seat). Or if you have a million children like I do, you have your oldest child in the front of the cart, 1 child in a buggy bench, and wear one. I only get approximately 5,000 strange looks. My husband installed the Cart Mama, while I installed the buggy bench and he didn’t fasten the center strap. I noticed about halfway through our shopping trip and secured it, but it was holding up fine. Also, yes… Margo is playing with a banana peel and Theo’s face… I just can’t handle it. The Cart Mama fits all shopping carts. 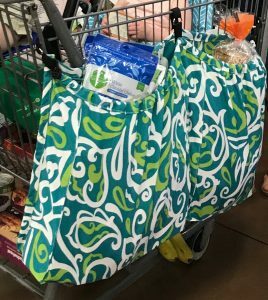 It’s best to put it on the right side of the cart because there is a little pocket at the top for your keys, cell phone, coupons, etc. My husband was pretty skeptical that it would hold all of our groceries, but it is very heavy duty! It holds up to 30 pounds of groceries. Between that and the basket under the cart, I’m always able to fit all of our groceries, for a family of 5. Theo likes to help by tossing items in. Don’t worry, it is machine washable in case he decides to go crazy and throw something that could get messy. I will say that the only con is that it makes the cart slightly more difficult to steer; HOWEVER, it is still easier to steer than a massive double cart. Who is the Cart Mama For? This is the perfect gift for a mom who is having her second or third child and doesn’t need much. Who is the Cart Mama NOT For? If you want to win one for yourself, check out the giveaway we are doing! To enter, visit my Instagram post and follow the directions there. Head on over to Cart Mama to check it out for yourself! They are also on Instagram and Facebook. Let me know if you get one and how you like it! I’d love to see pictures of your crew at the grocery store. 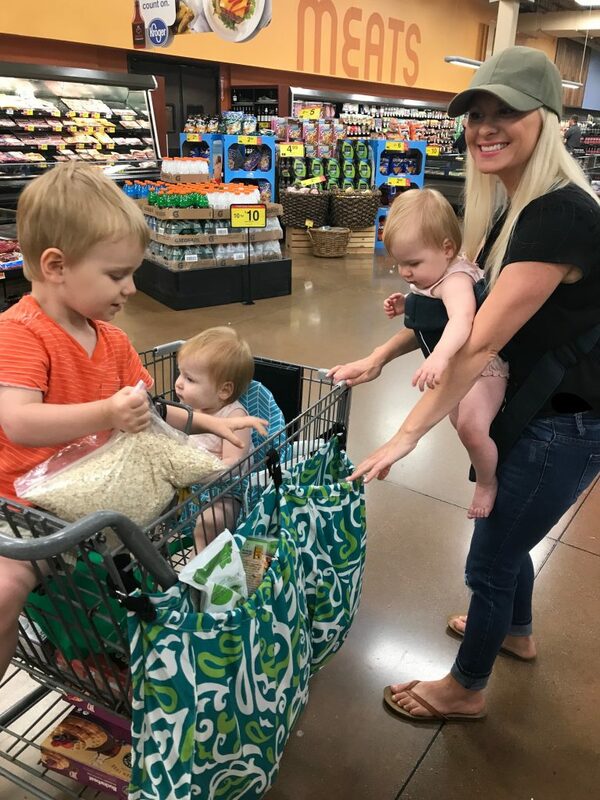 It definitely saves my life when I’m grocery shopping with my tribe; now if only there was a way to stop the “are those twins? ?” “you’re got your hands full!” and “are they all yours?” comments.